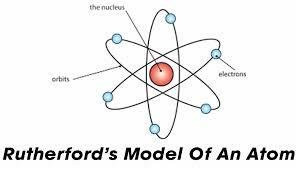 The Ernest Rutherford Atomic model was given by the New-Zealand born physicist Ernest Rutherford in 1911. According to this model, the atom constituted of a positively charged dense core called a nucleus which constituted the core mass of the atom. It was surrounded by negatively charged elements called electrons, which revolved around the nucleus the same way as planetary motion. The Ernest Rutherford Atomic model was named after Ernst Rutherford who, along with Hans Geinger gave this model in 1911. This model suggested that the atom consists of lots of open space and it has a small but dense core which is positively charged and is surrounded by relatively smaller electrons. What Did Ernest Rutherford Discover in the atom? According to Ernest Rutherford, the bulk of atomic mass was concentrated in the tiny centre of the atom called the nucleus. This discovery was made by Rutherford and Hans Geinger by conducting their famous gold foil experiment. 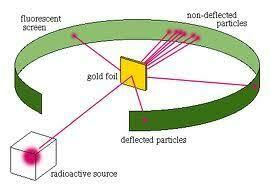 In this experiment, they enclosed a thin gold foil with alpha particles. The radioactive source was placed within a protective lead enclosure. He expected most of the beams to go through the gold foil. Some alpha particles went through the gold foil. Still, others got scattered at large angles. This suggested that only a dense and positively charged particle could get scattered at such great angles. Differences Between Atomic Theory of Thomson & Rutherford? The Thomson’s Atomic Model was given by J.J. Thompson in 1898. According to his model, the electrons were thought to have negatively charged electrons. And they are scattered around the positively charged nucleus, just like a pudding. Thus, it is also known as the Plum-Pudding model. Thompsons model focussed on the position of electrons in an atom but could not explain about the nucleus of an atom. 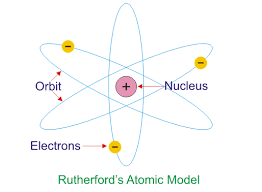 While Rutherford’s model stated that electrons revolved around a dense positively charged nucleus. Thompson’s model stated that the core of an atom consists of a positive charge which is enough to hold the electrons together just like currants in a pudding. While Rutherford’s model stated that the electrons are concentrated around a dense and comparatively smaller core called nucleus. Posted in Period TableTagged Ernest Rutherford Atomic Model Name, What Did Ernest Rutherford Discover in the atom?